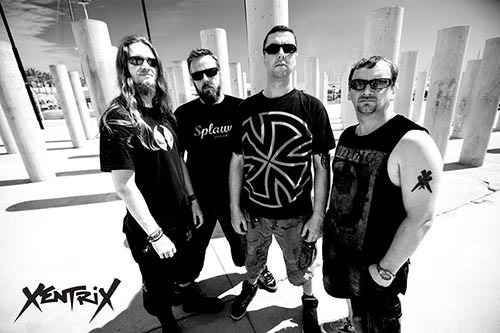 Xentrix (1988-1997, 2013-present) is a Thrash Metal band from Preston, Lancashire, UK. riginally forming in 1986 as Sweet Vengeance where the published only a four track EP, the act reformed as in 1988 during the heydays of Thrash as Xentrix. They were a rare British band that played a style comparable to any in the US "bay Area" scene at the time; similar in style to Testament. Under the membership of Chris Astley (vocals/guitar), Kristian Havard (guitar), Paul MacKenzie (bass) and Dennis Gasser (drums) they would release Shattered Existance (1989), Ghostbusters EP (1989), For Whose Advantage? (1990), Dilute To Taste (1991), Kin (1992) and The Order Of Chaos single (1992). They then split up but reformed in 1996 under the line-up of the returning Havard, MacKenzie and Gasser, along with Andy Rudd (guitar) and Simon Gordon(vocals) to release Scourge (1997) before splitting again. Previously, the band received controversy on their Ghostbusters EP for the unauthorized use of the Ghostbusters movie logo on the cover; the EP was subsequently re-issued with a new cover. The act has since tried to reform in 2013 with Chris Shires on bass.